Matthew Apgar - mapgar@shawmedia.com Crystal Lake South's bench, including Weston Buckner, right, erupts as they take a lead over Prairie Ridge in the Hinkle Holiday Classic boys basketball tournament on Wednesday, Dec. 23, 2015 at Harry D. Jacobs High School in Algonquin. 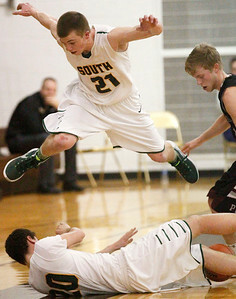 Crystal Lake South won 50-49. Matthew Apgar - mapgar@shawmedia.com Crystal Lake South's Joshua Friesen, right, and Tyler Haskin, left, celebrate a lead over Prairie Ridge in the Hinkle Holiday Classic boys basketball tournament on Wednesday, Dec. 23, 2015 at Harry D. Jacobs High School in Algonquin. 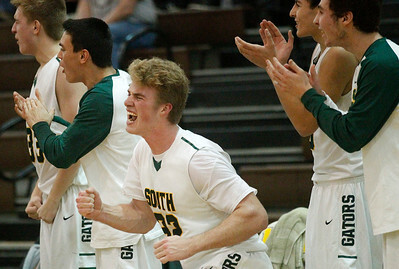 Crystal Lake South won 50-49. Matthew Apgar - mapgar@shawmedia.com Crystal Lake South's Zachary Geske, center shoots past Christopher Bradshaw, left, and Brian Dorn, both of Prairie Ridge, in the Hinkle Holiday Classic boys basketball tournament on Wednesday, Dec. 23, 2015 at Harry D. Jacobs High School in Algonquin. 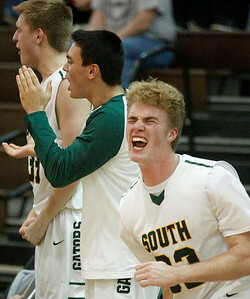 Crystal Lake South won 50-49. Matthew Apgar - mapgar@shawmedia.com Crystal Lake South's Zachary Geske, top, soars over teammate Luke Nolan as they and Prairie Ridge's Payton Otto, right, try to save the ball from going out of bounds in the Hinkle Holiday Classic boys basketball tournament on Wednesday, Dec. 23, 2015 at Harry D. Jacobs High School in Algonquin. Crystal Lake South won 50-49. Matthew Apgar - mapgar@shawmedia.com Crystal Lake South's bench, including Weston Buckner, center, erupts as they take a lead over Prairie Ridge in the Hinkle Holiday Classic boys basketball tournament on Wednesday, Dec. 23, 2015 at Harry D. Jacobs High School in Algonquin. Crystal Lake South won 50-49. 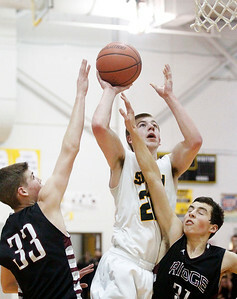 Matthew Apgar - mapgar@shawmedia.com Crystal Lake South's Weston Buckner, center, shoots the ball but is met with a block from Prairie Ridge's Christopher Bradshaw, back right, with additional defense from Andrew Eschweiler, back left, in the Hinkle Holiday Classic boys basketball tournament on Wednesday, Dec. 23, 2015 at Harry D. Jacobs High School in Algonquin. Crystal Lake South won 50-49. 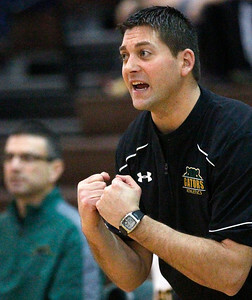 Matthew Apgar - mapgar@shawmedia.com Crystal Lake South coach Matt LePage gets animated on the sidelines against Prairie Ridge in the Hinkle Holiday Classic boys basketball tournament on Wednesday, Dec. 23, 2015 at Harry D. Jacobs High School in Algonquin. Crystal Lake South won 50-49. Matthew Apgar - mapgar@shawmedia.com Zachary Geske of Crystal Lake South takes a shot over Andrew Eschweiler of Prairie Ridge in the Hinkle Holiday Classic boys basketball tournament on Wednesday, Dec. 23, 2015 at Harry D. Jacobs High School in Algonquin. Crystal Lake South won 50-49. Matthew Apgar - mapgar@shawmedia.com Crystal Lake South coach Matt LePage goes over the game plan with the Gators during the annual Hinkle Holiday Classic on Wednesday, Dec. 23, 2015 at Harry D. Jacobs High School in Algonquin. 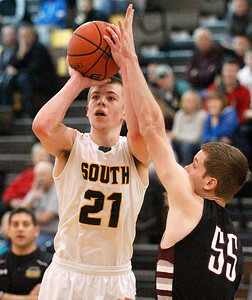 Matthew Apgar - mapgar@shawmedia.com Matthew Meyers of Crystal Lake South delivers a layup past Prairie Ridge in the Hinkle Holiday Classic boys basketball tournament on Wednesday, Dec. 23, 2015 at Harry D. Jacobs High School in Algonquin. Crystal Lake South won 50-49. 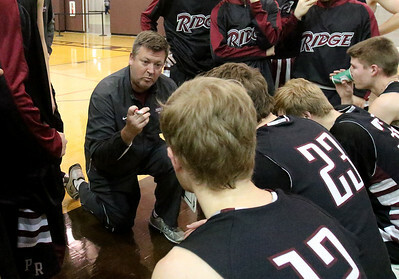 Matthew Apgar - mapgar@shawmedia.com Prairie Ridge head coach Corky Card goes over the game plan with the Wolves during the annual Hinkle Holiday Classic on Wednesday, Dec. 23, 2015 at Harry D. Jacobs High School in Algonquin. 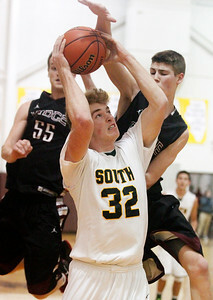 Matthew Apgar - mapgar@shawmedia.com Andrew Eschweiler of Prairie Ridge, back, fouls Crystal Lake South's Matthew Meyers on a shot in the Hinkle Holiday Classic boys basketball tournament on Wednesday, Dec. 23, 2015 at Harry D. Jacobs High School in Algonquin. 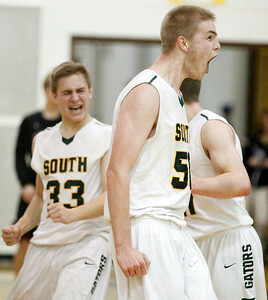 Crystal Lake South won 50-49. 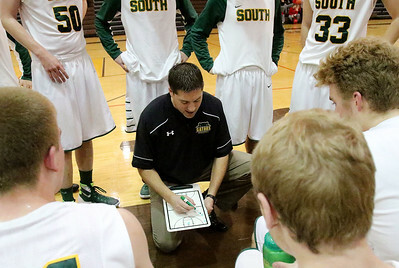 Crystal Lake South coach Matt LePage goes over the game plan with the Gators during the annual Hinkle Holiday Classic on Wednesday, Dec. 23, 2015 at Harry D. Jacobs High School in Algonquin.